Interstate 410 (Connally Loop) is a beltway around San Antonio. The northeastern quadrant overlaps with IH 35 between Kirby and Windcrest. SH 16 accompanies the western third of IH 410 from south San Antonio to Leon Valley. The state highway travels north from Zapata on the Rio Grande to U.S. 281 near Antelope, just south of Wichita Falls. The Interstate Route Log and Finder List does not attribute the overlapped mileage with IH 35 to IH 410. The zero milepost is located at the southwestern exchange with IH 35. Interchanges are numbered in a clockwise direction from that point. The northern half of the Connally Loop, from U.S. 90 near Lackland Air Force Base to IH 35 at Windcrest is a heavily developed freeway. Suburban development extends outward from San Antonio toward the northwest and northeast along the IH 10, IH 35 and U.S. 281 corridors. South from U.S. 90 and IH 10, IH 410 runs along the periphery of San Antonio, with rural four lane stretches remaining. Interstate 410 around San Antonio was constructed through the 1950s and 1960s. The first beltway section opened in 1958.1 IH 410 was added to the Interstate system as approved by the American Association of State Highway Officials (AASHO) on June 30, 1970. Construction through 2006 modernized IH 410 between Interstate 10 and U.S. 281. Work widened the narrow, below-grade freeway and added a systems interchange with U.S. 281 (McAllister Freeway) by San Antonio International Airport (SAT). This exchange replaced a Breezewood connection between the two freeways along San Pedro Avenue to the west. Button copy signs formerly posted along IH 35 south for IH 410, SH 16 and SL 353 (old U.S. 81). 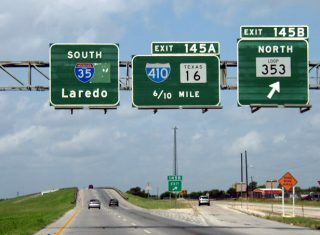 The sign for Laredo predated the truncation of U.S. 81 out of South Texas. Photo taken by Chris Patriarca (06/24/03). A slip ramp (Exit 32) connects with the IH 410 frontage road for Dietrich Road south of Kirby. Guide sings for IH 10 were replaced to include SH 130 north to Seguin. Photo taken by Chris Patriarca (06/24/03). Collector distributor roadways connect IH 410 with IH 10, U.S. 90 and SH 130 at the full cloverleaf interchange (Exit 33) between the two freeways. Photo taken by Chris Patriarca (06/24/03). Continuing on the c/d roadway to the westbound ramp for IH 10 and U.S. 90 toward Downtown San Antonio. Photo taken by Chris Patriarca (06/24/03). IH 410 (Connally Loop) crosses paths with U.S. 87 (Rigsby Road) 2.5 miles south of IH 10, U.S. 90 and SH 130. Photo taken by Chris Patriarca (06/24/03). A diamond interchange (Exit 34) with FM 1346 (East Houston Street) precedes IH 10, U.S. 90 and SH 130 on IH 410 northbound. FM 1346 loops 20.23 miles east from SL 13 (W.W. White Road) in San Antonio to Saint Hedwig and La Vernia. Photo taken by Chris Patriarca (06/24/03). One quarter mile separates the entrance ramp from FM 1346 and the c/d roadway (Exit 33) for IH 10, U.S. 90 and SH 130 north. Photo taken by Chris Patriarca (06/24/03). IH 410 maintains just four lanes through the cloverleaf interchange with Interstate 10 and U.S. 90. Photo taken by Chris Patriarca (06/24/03). IH 10 overlaps with U.S. 90 and SH 130 east to Seguin. SH 130 branches northward from there along a high speed toll road toward Austin. Photo taken by Chris Patriarca (06/24/03). IH 410 north at the loop ramp for IH 10 & U.S. 90 westbound, prior to adjacent development of distribution centers. Photo taken by Chris Patriarca (06/24/03). Two miles west of Interstate 410 on IH 10 & U.S. 90 at Exit 579 and Houston Street. Houston Street, along with Commerce Street, represents the old alignment of U.S. 90. Photo taken by Chris Patriarca (06/24/03). IH 10 meets SL 13 (W.W. White Road) with a mile of IH 410 (Connally Loop). State Loop 13 represented the main arterial route through east San Antonio prior to construction of Interstate 410. Photo taken by Chris Patriarca (06/24/03). Exit 580 departs IH 10 & U.S. 90 east for State Loop 13. SL 13 concludes 1.6 miles to the north at IH 410 just south of the merge with IH 35. Photo taken by Chris Patriarca (06/24/03). Sign changes made for the cloverleaf interchange (Exit 581) with IH 410 added SH 130 for the beltway south. SH 130 overlaps with the beltway 19.5 miles west to IH 35. Photo taken by Chris Patriarca (06/24/03). A lane drop occurs along IH 10 & U.S. 90 east at the collector distributor roadway (Exit 581) for Interstate 410 and State Highway 130 south. Photo taken by Chris Patriarca (06/24/03). IH 410 & SH 130 travel south from IH 10 to IH 37 nears Brooks City Base. Photo taken by Chris Patriarca (06/24/03). Eastbound on the c/d roadway at the loop ramp for IH 410 north to Kirby, Windcrest and IH 35 to Austin. Photo taken by Chris Patriarca (06/24/03). Spanning Ackerman Road, one quarter mile from the slip ramp (Exit 581) to the c/d roadway for IH 410 (Connally Loop). IH 410 is the third and final Interstate beltway along IH 10 between Jacksonville, Florida and Southern California. Photo taken by Chris Patriarca (06/24/03). Replaced button copy guide at the separation of Exit 581 from IH 10 & U.S. 90 west. Photo taken by Chris Patriarca (06/24/03). Control cities are not used for IH 410 along IH 10 & U.S. 90. Photo taken by Chris Patriarca (06/24/03). SH 130 joins IH 410 south from IH 10 west for the continuation to IH 13 on the south side of San Antonio. IH 10 continues west to IH 37, which leads motorists to Downtown San Antonio, located nine miles away. Photo taken by Chris Patriarca (06/24/03). Previous guide signs for IH 10 along IH 410 included San Angelo for westbound and Houston for eastbound. U.S. 87 overlaps with IH 10 west 41 miles from Loop 410 to Exit 523. Photo taken by Chris Patriarca (06/24/03). Following the high flyover for IH 10 & U.S. 87 prior to completion of the ramp for IH 10 east to central San Antonio. Photo taken by Chris Patriarca (06/24/03). The flyover from IH 410 north to IH 10 west combines with the flyover from IH 410 south before joining the freeway mainline. El Paso lies 556 miles to the west. Photo taken by Chris Patriarca (06/24/03). The heaviest traveled section of Interstate 410 is the arc west from San Antonio International Airport (SAT) and the city of Castle Hills to IH 10 & U.S. 87 at Exit 16. Photo taken by Chris Patriarca (06/24/03). Prior to reconstruction of Exit 16 into a systems interchange, a left exit linked the outer loop of IH 410 with IH 10 east & U.S. 87 south to central San Antonio. Photo taken by Chris Patriarca (06/24/03). All traffic to IH 10 & U.S. 87 separates from IH 410 westbound below the Cherry Ridge overpass. Photo taken by Chris Patriarca (06/24/03). A flyover ramp added in 2002-04 road work for IH 10 east replaced this left side ramp at Exit 16A. Photo taken by Chris Patriarca (06/24/03). Interstate 10 west & U.S. 87 north navigate along an S-curve 2.25 miles out from IH 410 (Connally Loop). The forthcoming beltway is named after a former Texas congressman. Photo taken 12/31/02. IH 10 enters the city of Balcones Heights at Exit 565A for Crossroads Boulevard south of IH 410. Photo taken 12/31/02. Remaining button copy sign for Interstate 410 posted during the 2002-04 upgrade of the multi level interchange at Exit 564. Photo taken 12/31/02. Separate ramps departed from the IH 10 westbound mainline for IH 410 east to Castle Hills and west to Leon Valley. Photo taken 12/31/02. Flyovers replaced all movements between IH 10 and IH 410 in northwest San Antonio. Photo taken 12/31/02. One mile north of the four level interchange (Exit 564) with Interstate 410 on IH 10 east & U.S. 87 south at the Medical Drive over crossing. Photo taken by Chris Patriarca (06/24/03). Two lanes depart from Interstate 10 east for IH 410 east to San Antonio International Airport (SAT) and southwest to Lackland A.F.B. in 0.75 miles. Photo taken by Chris Patriarca (06/24/03). Exit 564 leaves IH 10 east & U.S. 87 south for Interstate 410 beyond the Callaghan Road overpass. Photo taken by Chris Patriarca (06/24/03). Traffic taking Exit 564 climbs onto the flyover system linking IH 10 with IH 410 east to Castle Hills and IH 35 north for Austin and IH 410 south to Leon Valley and IH 35 south for Laredo. Photo taken by Chris Patriarca (06/24/03).